Kino Lorber has released a new trailer for the critically acclaimed documentary Grace Jones: Bloodlight And Bami. It will have a theatrical release nationwide this spring, following its highly regarded debut at the 2017 Toronto Film Festival. Directed by Sophie Fiennes, the documentary explores the public and private worlds of the legendary artist. Kino Lorber is distributing the film in the United States and Canada. 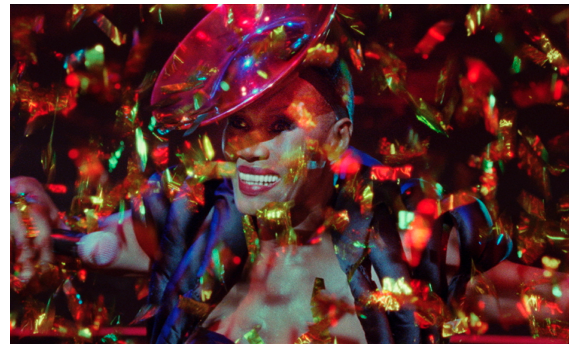 It will first be released New York at Metrograph, BAM and the Film Society of Lincoln Center on April 13, followed by Los Angeles on April 20, San Francisco, Chicago, Boston, Dallas, Houston, Philadelphia, DC, Miami and Detroit. In Canada, the film will open in Toronto, Montreal and Vancouver in the weeks following the New York release. Sophie Fiennes' previous work includes experimental works with Slovenian philosopher Slavoj Žižek, The Pervert’s Guide to Cinema (2006), and The Pervert’s Guide to Ideology (2012), her portrait of German artist Anselm Keifer, Over Your Cities Grass Will Grow (2010), and Hoover Street Revival (2001) about a Pentecostal church community in Los Angeles. Check out the synopsis below. "Recorded over the course of several years, Fiennes—best known for her experimental works with Slovenian philosopher Slavoj Žižek—profiles Jones in full, both as larger than life performer, fashion icon and symbol; and as lover, daughter, mother, sister and grandmother in her day to day life. Featuring live shots of Jones performing her iconic hits “Slave To The Rhythm” and “Pull Up To The Bumper” as well as more recent, introspective tracks like “Williams’ Blood,” “This Is” and “Hurricane” alongside intimate footage of time with her son Paulo and niece Chantal in her native Jamaica, the film investigates the full breadth of Jones’ life from childhood to the now, as she continues to perform worldwide."